Marie Lavoisier, the daughter of wealthy aristocrats, was a chemist and translator, as well as a student of Neoclassical painter Jacques-Louis David. 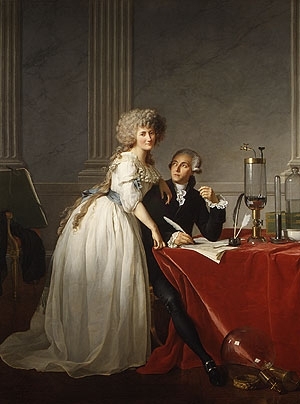 She shared her interest in science with husband Antoine-Laurent Lavoisier, whom she married in 1771 at the age of thirteen. The couple hosted salons for the discussion of science and philosophy and conducted scientific experiments. Madame Lavoisier performed research, wrote detailed accounts of her findings, and drew the illustrations for her husband’s publication, Traité élémentaire de chimie (Elementary Treatise on Chemistry, 1789). She mastered English (unlike Antoine) and translated chemical works for him. After her husband was executed during the French Revolution, Madame Lavoisier continued her scientific work, edited his memoirs, and published them as Mémoires de chimie in 1805.